Team, Stone Roses and Franz Ferdinand Released: 2008-07-11. Final Fantasy Crystal Chronicles: Ring of Fates. SpielLanguage usually English/German. Pattern picture! Item may differ from the photo. Mostly first edition (platinum or similar is possible). The Konsolenkost-Team wishes you a lot of fun. The player has three monsters in a party which can be given direct orders or set to one of 4 AI settings. DRAGON QUEST MONSTERS JOKER - DS. Enter the world ofDragon Quest Monsters: Joker as the young hero, locked in a prison by your own father, the leader of a mysterious organization known as CELL. 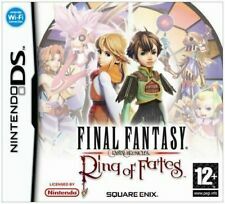 Nintendo DS Final Fantasy Crystal Chronicles Ring of Fates. Nintendo Catalogue NTR P AFXP EAN. Official UK Pal Release. Nintendo DS:Final Fantasy Ring of Fate. Original UK PAL release which is new & factory sealed, with the clear tear strip embossed with the red recycle symbol. UK PAL version. A couple of little dents on the back. Can also be played on the Nintendo 2DS and 3DS consoles. Final Fantasy IV. Nintendo DS:Dragon Quest - Sentinels of the Starry Skies. Original UK PAL release which is new & factory sealed, with the black "Nintendo" embossed tear strip. Any other type of tear strip (or lack of) is a fake or re-seal. Nintendo DS:Dragon Quest IX - Sentinels of the Starry Skies, UK Graded. The pictures show the actual item for sale. 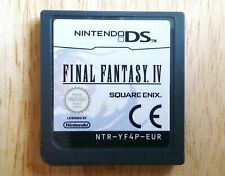 Final Fantasy IV (Nintendo DS). Title:Final Fantasy IV (Nintendo DS). All of our paper waste is recycled within the UK and turned into corrugated cardboard. General Interest. Your item will be previously owned but still in great condition. Nintendo DS:Dragon Quest Monsters 2. Original UK PAL release which is new & factory sealed, with the black "Nintendo" embossed tear strip. Be aware that any seal which doesn't have the Nintendo tear strip is a fake ! Title:Final Fantasy - Final Fantasy Crystal Chronicles: Ring of Fates (Nintendo DS). Artist:Final Fantasy. General Interest. Your item will be previously owned but still in great condition. The disc will play perfectly without interruption and the case, inlay notes and sleeve may show limited signs of wear.